The company provides innovate quality of service (QoS) and compliance monitoring solutions for broadcast, telco, satellite, cable, and IPTV video networks. 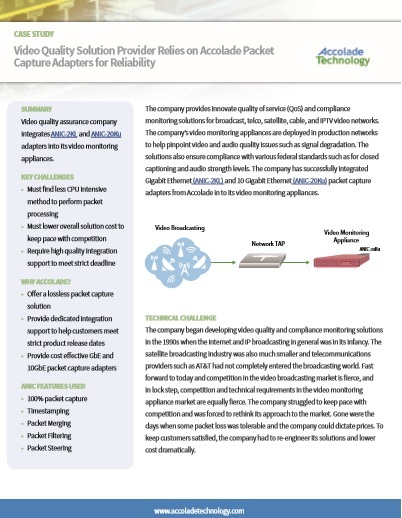 The company’s video monitoring appliances are deployed in production networks to help pinpoint video and audio quality issues such as signal degradation. The company began developing video quality and compliance monitoring solutions in the 1990s when the Internet and IP broadcasting in general was in its infancy. Fast forward to today and competition in the video broadcasting market is fierce, and in lock step, competition and technical requirements in the video monitoring appliance market are equally fierce. To keep customers satisfied, the company had to re-engineer its solutions and lower cost dramatically. Packet loss and overall solution cost were the two biggest issues with the existing video monitoring appliances. To mitigate these problems, the company decided to integrate the ANIC-2KL and ANIC-20Ku packet capture adapters in to each appliance.